Although previous speakers have indicated that there are grounds for some hope in the management of patients with malignant brain tumours particularly in the trials of the nitrosoureas it is still recognised that in the management of the individual patient there is still much work to be done before any significant prolongation of survival and improved quality of survival can be achieved. Neurosurgeons must still rely upon the conventional methods of management which include surgical decompression with or without radiotherapy and chemotherapy. 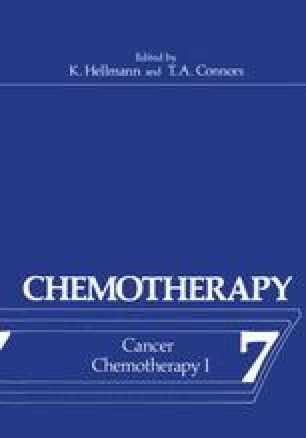 This paper reports a small preliminary study using the intracavitary method of chemotherapy. It is open to several points of criticism which will be discussed but the workers were led to introduce this method of therapy by the poor results they obtained by conventional methods of therapy in previous years. The administration of chemotherapeutic agents directly to a brain tumour cavity is attractive for several reasons. First the malignant supratentorial gliomas rarely metastasise either widely or elsewhere in the nervous system, recurrence is usually at the same site as the first growth, the method would allow administration of very high dosage of the agent at its required site of action and the route might surmount some of the problems of the blood brain barrier.